Enterprises today continue to differentiate themselves with cloud applications – any application that needs to be always-on, distributed, scalable, real-time, and contextual. With DataStax Enterprise, DataStax delivers comprehensive data management with a unique always-on architecture that accelerates the ability of enterprises, government agencies, and systems integrators to power the exploding number of cloud applications. DataStax Enterprise (DSE) powers these cloud applications that require data distribution across data centers and clouds, by using a secure, operationally simple platform. At its core, DSE offers the industry’s best distribution of Apache Cassandra™. 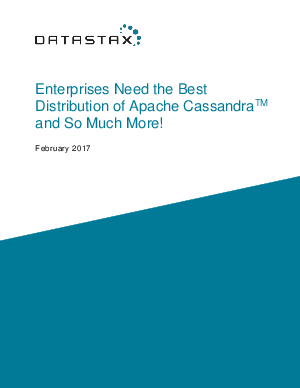 This paper provides a summary of the features and functionality of DataStax Enterprise that make it the best choice for companies that are looking to leverage the promise of Apache Cassandra™ for production environments.